Pumpkin carrot cupcakes studded with chopped walnuts, raisins, crushed pineapple, and shredded coconut. Decorated with a swirl of cream cheese frosting! Thanksgiving is almost here and I couldn’t be more excited! Currently, I’m making plans for what to bake for my family on Thursday, as well as over the long weekend. Black Friday shopping is completely overwhelming to me, so you can bet I’ll be staying at home baking my heart out instead! In the meantime, today I’m bringing you my very last pumpkin recipe of the season! These pumpkin carrot cupcakes are based on my pumpkin carrot layer cake recipe, which is one of my favorite recipes. It has an extra special place in my heart because it was the first cake recipe I ever started developing. Speaking of firsts, over the weekend, I had the privilege of helping my friend Barney bake his first ever layer cake. He chose the pumpkin carrot cake recipe since carrot cake is one of his favorite desserts too. It was so much fun getting to see a friend experience the joy of baking. I wish I could bake along with each one of you too! Barney and experimented with three layers instead of six for my pumpkin carrot cake, so I’ll be updating the recipe notes to include the oven times for eight-inch layers in case you’re interested. The batter for these pumpkin carrot cupcakes is chock full of raisins, crushed pineapple, shredded coconut, and chopped walnuts. It’s a lot of ingredients, but I promise it’s all absolutely worth it! If you’re looking to make the work a bit easier, I shared about my favorite carrot shredding tool in my pumpkin carrot cake post. Give it a try, you’ll love it! To decorate these cupcakes, I made a simple cream cheese frosting, because in my opinion, nothing out there beats cream cheese frosting! Especially when we’re talking pumpkin and carrot cake. If you’re feeling extra festive, you can lightly dust the top of each cupcake with cinnamon as well. 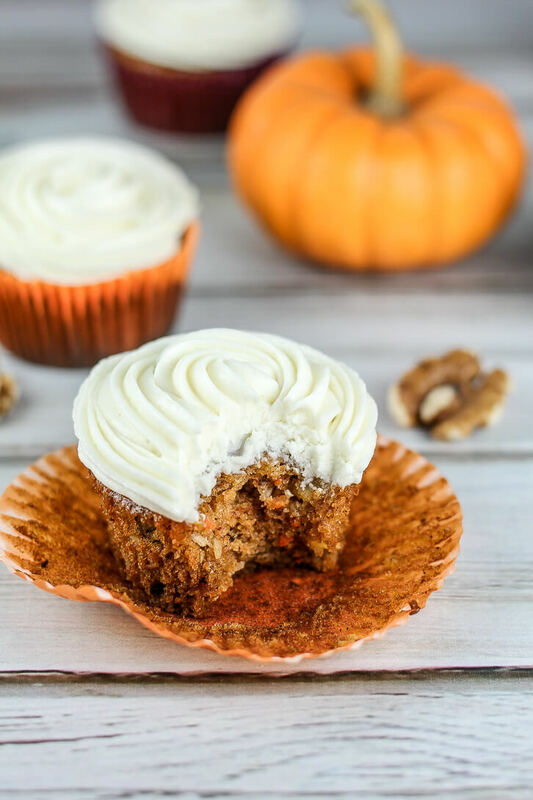 These pumpkin carrot cupcakes are definitely my new favorite cupcakes and I know you’ll love them too! If you try this recipe, tag @flourcoveredapron on Instagram so I can see your lovely creations! Preheat oven to 375 degrees and prepare two cupcake tins with paper liners. This recipe makes approximately 23 cupcakes. Spray lightly with cooking spray. In a medium size bowl, whisk together flour, baking soda, baking powder, salt, and spices. In a large bowl, whisk together both sugars, oil, eggs, vanilla, and pumpkin. Add milk, then beat until combined. Then, fold in pineapple and carrots. Gradually add dry ingredients to the wet ingredients, folding to combine after each addition. Then, fold in coconut, raisins, and walnuts. Pour batter into tins, dividing evenly and filling each tin approximately two thirds of the way full. Bake at 375 degrees for 13 minutes, then reduce heat to 350 and bake for another 7-9 minutes, or until cupcakes pass the toothpick test. Let cool in pan for about 5 minutes, then transfer cupcakes to a wire rack to cool completely. Using an electric mixer, beat together cream cheese and butter until light and fluffy and well incorporated. Add vanilla and salt, then gradually add powdered sugar, mixing on low speed until incorporated and desired consistency is reached. Fill a piping bag fitted with a large open star tip with frosting and pipe swirls on to each cupcake. Dust with cinnamon if desired.